I keep striving to bring more positivity into my life. Love at first sight, is how I would describe most of the pieces I'm wearing here. The tassel tee was an impulse purchase last summer, I spotted it in the window of one of the numerous H&Ms I walked past in California. 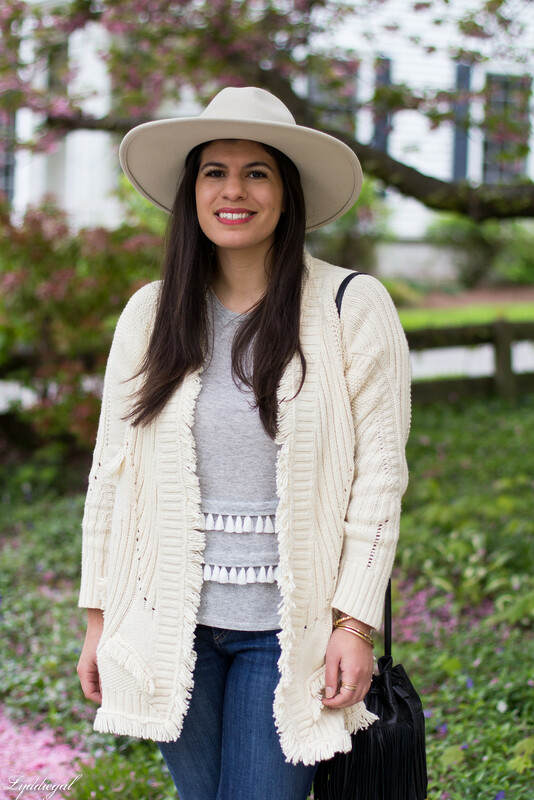 I saw the fringe cardigan on Little Blonde Book, and even though it was sold out at the time, there was eBay... which brings me to the hat, which I saw in the store and fell in love with, but had my reservations when it came to the price tag. Happily I was able to find it on eBay as well for a steal! The shoes I've had forever, and wouldn't you know it, now mules are trending again. Though, were they even trending when I bought them? I can't remember. Loving all of this fringe!! Your top is so cute and the cardigan is gorgeous! I love the cardigan. The fringe details on it are so nice. This cardigan is super cute + would be awesome for cool days or even thrown over the top of denim cutoffs and a tank for a summer evening. I really love the tassels on your top! So fun! Even though I do try to stick to a list when shopping, I find that those "love at first sight" pieces I pick up I never end up regretting. I love that fringe tee, and I feel like I would get a lot of wear out of sandals like those. They look so versatile! My fave piece here is that spectacular cardigan !! 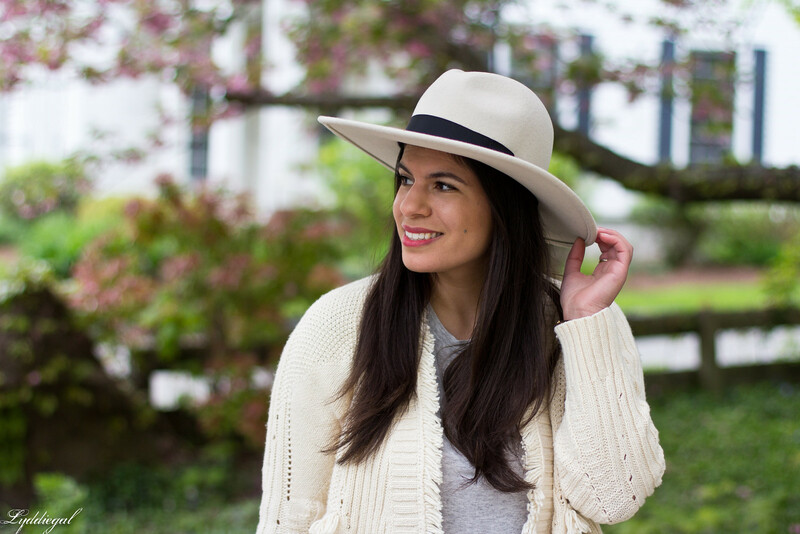 I have to admit that tassels and hats are my new faves!! Isn't it just the best when impulse purchases work out so well? 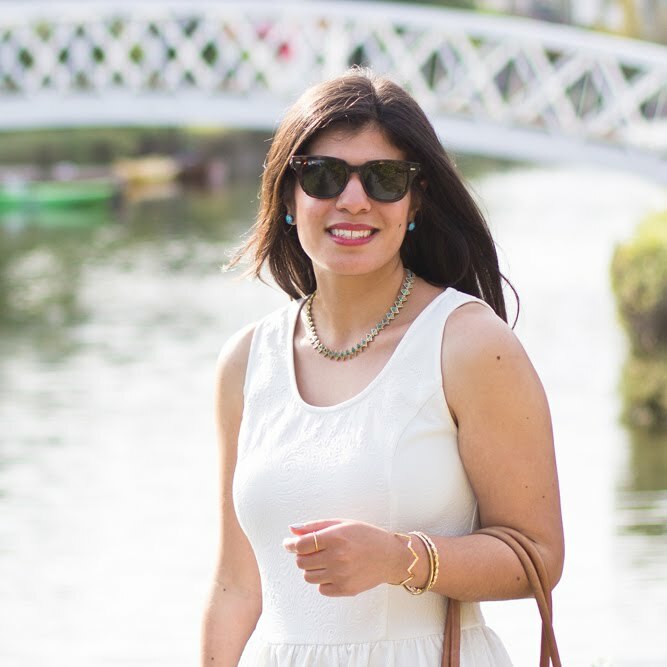 I try as much as I can to control my impulse shopping, but sometimes that just doesn't work out, but most of my impulse purchases over the last little while have turned out to be wardrobe favourites - and it sounds like that's the case for you with all the impulse purchases in this look, too. I really admire the success you have with eBay, I've been hunting down a couple of pieces for months with absolutely no luck despite constant searching. You could probably teach a course on how you do it! 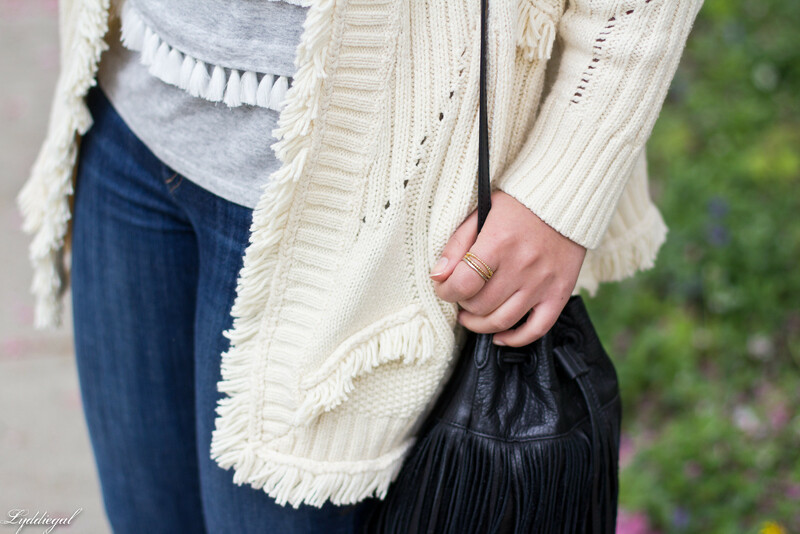 Loving your fringe details in this look! Fun finds. I love Little Blonde Book. She always have the best pieces. Those tassels are seriously just the cutest little detail. And I love soft grey shades as a summer time palette. Love all the fringe! Don't you love that even though things are sold out, a lot of times you can still find them?? And those shoes are too cute! You have to love those ebay bargains! There and poshmark are two places I love to check when I am searching for something specific that is sold out! 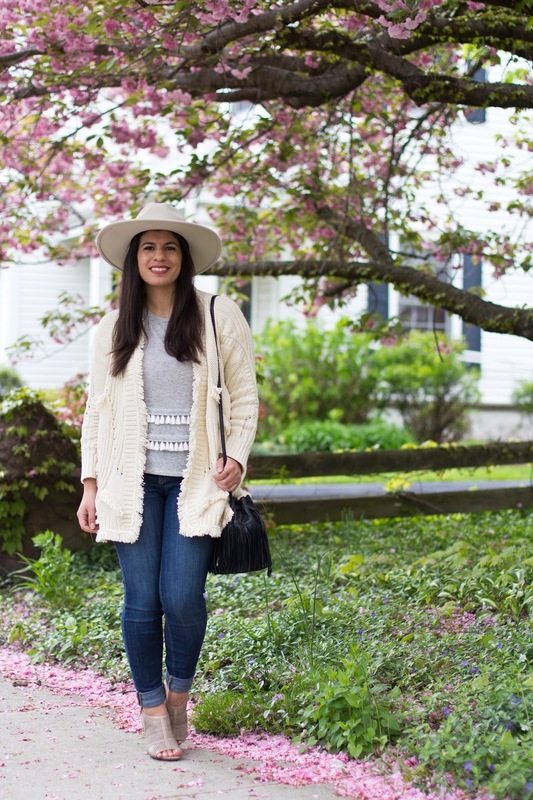 The cardigan and hat were great finds! 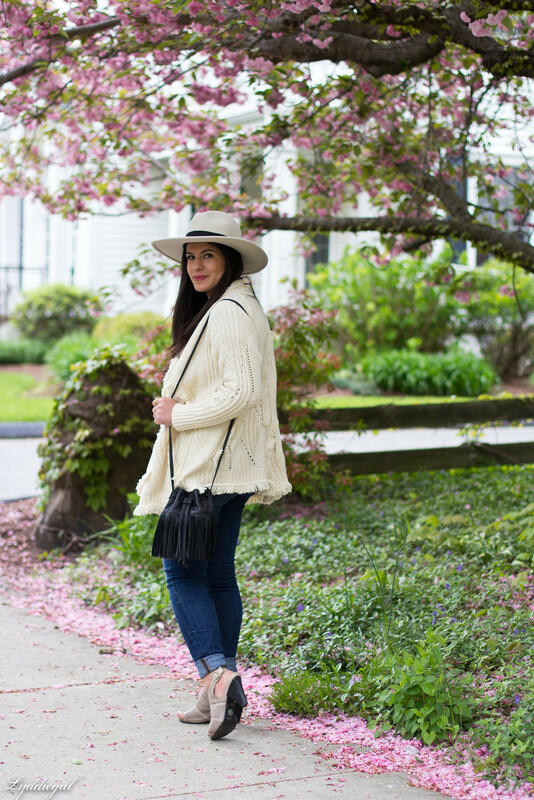 Loving the look of this fringed cardigan! It's stunning! I can totally see why you love these pieces! 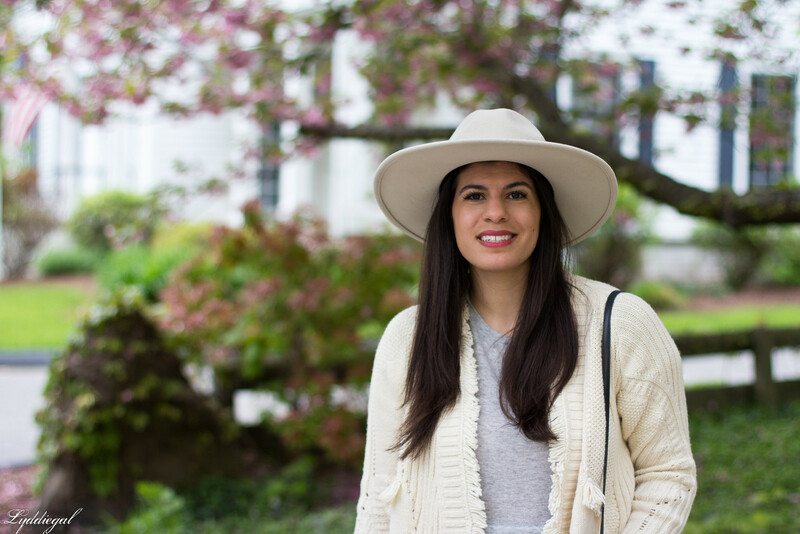 The hat and cardigan are my faves and I can definitely see why you hunted them down on ebay. I haven't actually bought many clothing items on ebay. Is it pretty reliable? I'm a clothes hoarder so I keep things in my closet forever. I get so excited when something old comes back in style! That top is adorable! I'm glad that you found it on eBay! I love it when items come back in style too. I have a giveaway for designer home decor and furniture - enter to get some fab stuff for your home! Coolest top. I feel like these shoes are more like slingbacks as mules tend to be more of a slip-on thing. And wow, I am in love with your hat. Need it ASAP. Love your grey tassel t-shirt! So cute! 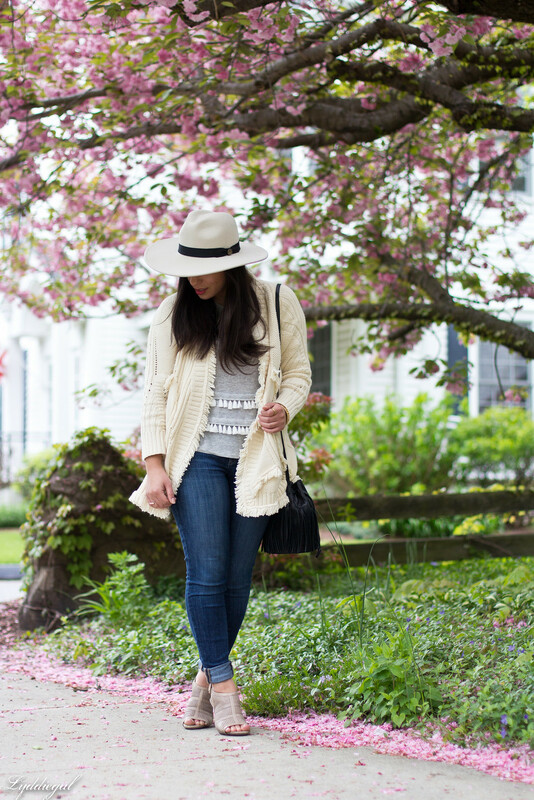 Wow that cardi looks amazingly cozy! Love the fringes! Fabulous look. Love your cardigan. I just got myself a fringe bag too! I couldn't resist how they add fun to an outfit! 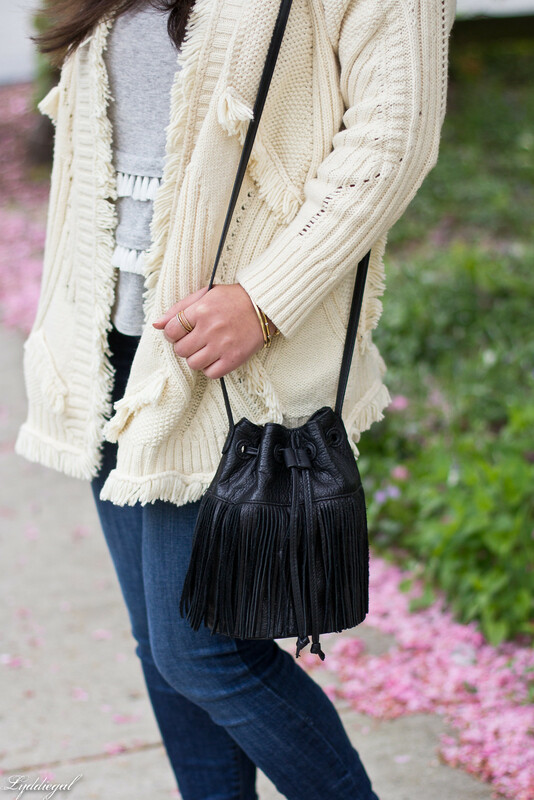 I love the double tassel/fringe on your bag and the top!